Can this souped-up Sandman bring new ideas to the table? We loved Sandman, but the Pro version is a whole new ball game, primarily thanks to the new modulation system and Delay Modes, and that crazy Sleep Buffer display. Six delay modes . Powerful modulation system. Sample Rate control is still a winner. Two filters. Sleep Buffer waveform display is ace. Can't zoom waveform display. Needs more filter types and slopes. 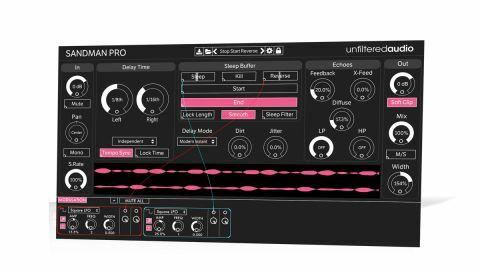 Unfiltered Audio's Sandman seriously impressed us on its original release thanks to its playful combination of delay and looper functionality. The follow-up, Sandman Pro (VST/AU/AAX), ups its games in both areas. The first change is to the architecture of the delay line. Six new modes have been added to the original, which is now called 'Classic Tape' and comes with Saturate, Wow and Slew knobs. The other modes have their own control sets, offering up a rich variety of echo-related shenanigans, from granular pitchshifting and reverse delays, to 'instant' delay time changes and a 16-tap multi-tap. The sixth mode, No Echo, feeds the input directly to the Sleep Buffer for delay-free stutter effects. The left and right delay times can be unlinked, too, in Independent (separate Delay Time knobs for each channel) or Offset (the right channel knob applies offset from the left channel's Delay Time) modes. The new Echoes section contains further delay-shaping parameters. Feedback and X-Feed control the amount of each channel fed back into itself and the other channel, while Diffuse dials in an all-pass filter that 'smears' the delays for a blurring effect. The filter's been doubled up too, with a 12dB high-pass running alongside the original's low-pass - but we're surprised there's no 24dB option, and that they're not multimode. Hit the Sleep button and Sandman Pro's delay buffer is frozen and looped, freeing you up to get creative with the plugin's other parameters and some dedicated controls. Exclusive to the Sleep Buffer in Pro are buttons for Reverse (a one-touch alternative to inverting the Start and End points), Smooth (similar to Sandman's Remove Clicks button but with different operation) and Sleep Filter. Perhaps the coolest new Sleep Buffer feature, though, is the waveform display. When not in Sleep mode, this simply shows the input signal; in Sleep mode, though, it visualises the left and right channel buffer contents and the 'playhead' position within them in real time, so that modulating the delay times, for example, causes the waveforms to stretch and compress. It's an awesome graphical aid, although it could do with an option to zoom in on the active Start/End range, as without that, it's effectively useless with very short buffer sizes. Sandman features a pair of LFOs for wobbling a handful of parameters, but Pro swaps this for the same superb modulation setup as Unfiltered's Fault. Clicking the Modulation button pops out a panel into which up to six modulation sources can be loaded. The signal types available to each source comprise Sine, Saw/Triangle and Square LFOs, an envelope follower, Sample + Hold Noise, and a Macro knob. When the Modulation panel is open, a small input 'socket' appears on all viable targets (every knob and slider, and almost all buttons), and to make an assignment you drag a virtual cable from the modulator output to the target parameter's input. A single source can modulate as many targets as you like, sources can modulate each other, and modulated parameters are representatively animated in the GUI. Lastly, the stereo Width knob and M/S button enable narrowing and broadening of the stereo image and mid/side encoding, and Soft Clip applies analogue-style saturation to 'overs'. There's not a single significant element of Sandman that hasn't been radically overhauled for its Pro transformation. The new delay modes and freeform modulation system would have been worth upgrading for on their own, but add in the waveform display, the high-pass filter, and the Echoes section, and it becomes immense. There are more detailed delay plugins out there, for sure, but Sandman Pro's six Delay Modes are perfectly - ahem - pitched for creative sound design, and the looper is just amazing. From dubbed-out tape delays and rich multitaps to mind-bending psychedelic soundscapes and glitchy micro-loops, Sandman Pro does it all and more.